Do we remember these little numbers? They were all made using the same basic pattern. I made modifications to each, but the basic shirt is the same. Today I'm going to give you a tutorial on how to make your own cap sleeve T-shirt using an existing shirt. If you don't have an existing shirt, then I have included measurements for a size Small/Medium shirt. 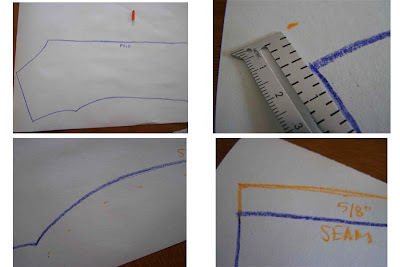 You can draw out your own pattern and adjust the measurements as needed. It is always a good idea to find a shirt that you like for comparison (on fit). This is a two piece shirt. There is a front piece and a back piece, making this a great sewing project for those who are afraid to sew clothing or make their own patterns. If you are afraid to sew with knits then check out these previous posts on selecting and sewing knits. The cap sleeve shirt that I used for my pattern is a layering t-shirt. DownEast Basics sells some, but this one happens to be by Apricot. This one I purchased when I was pregnant with my son (it is maternity), I've continued wearing it because I love the length of it. You can tell that it has seen better days, this was my motivation to try to make one of my own. If this is the first time you are making your own pattern, then visit this link for some additional information on making patterns from existing clothing. For the tutorial click Read More below. Find a large piece of paper. In this photo I am using a simple piece of newsprint, but if you have pattern paper that will work as well. I've also used freezer paper to make patterns, it is a bit thicker and sturdier than using newsprint. If you choose to make your pattern on freezer paper then make sure that you trace your pattern onto the matte side of the paper. If you have an existing shirt that you are working from you will want to fold the shirt down the middle. Make sure that wrinkles are smoothed out (unlike in my photo). You will also want to make sure that the hem line is even, and that the arms and shoulder seams are lined up properly. Lay your shirt out on a nice long piece of paper. You will want at least 1" extra room surrounding the shirt. We are going to add in seam allowances, so the extra space is necessary. Using some sort of a marking utensil trace the outline of the folded shirt. You will want to do this twice, once with the arc of the back neckline, and once with the lower arc of the front neckline. So when you are done you will have two pattern pieces. Mark "Fold" on the fold side of your pattern piece. This will be down the side with the deepest part of the neckline, opposite to the sleeve side (see upper right image). It is now time to add in seam allowances. This pattern piece has two sides with seam allowances, the shoulder seam (connects the two pieces of fabric on top of the shoulder), and the side seam (connects the fabrics under the arms down to the hem). 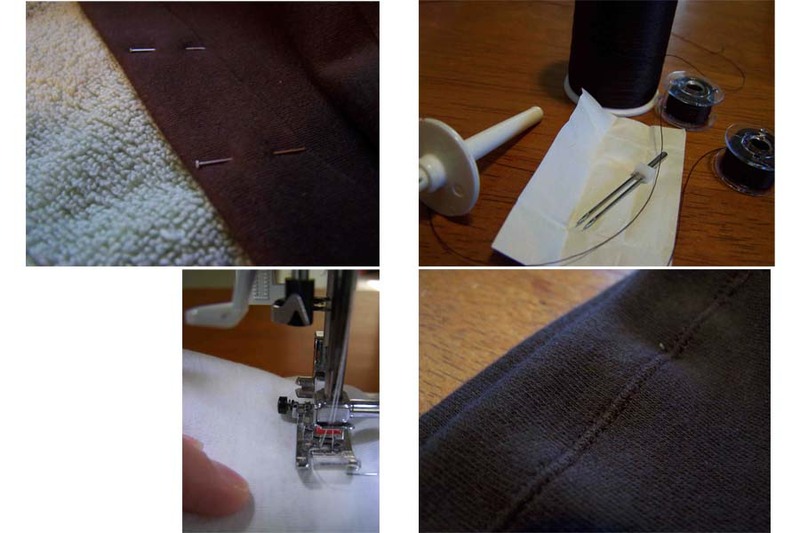 See Sewing Sequence image below: Shoulder Seams-A, Side Seams-C. I factored in 5/8" seam allowance to all of my seams. To do so find a ruler and begin marking. Make marks along the length of the seams 5/8" away from the original line. Once you have created your dashed marks, connect them creating a solid line. (See lower left and right). When you have added in your seam allowance along both the shoulder and side seams then it is time to factor in length for the hem of the shirt. I added a 1" hem allowance. Use the same marking technique to add the extra 1". Once you have factored in the hem and seam allowances on your front and back pattern pieces your pattern is done. You should now have two pattern pieces with slightly different necklines. You can cut them out and cut out your fabric. You will need one piece for the front, and one piece for the back. You will also need some ribbing for the arms and neck. I used ribbing that was 1 1/2" wide for the arms and 2" for the neck. 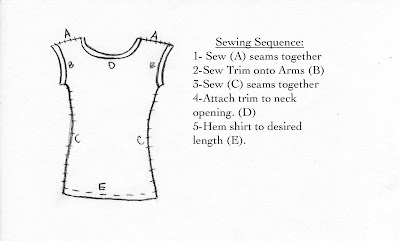 Find the Printable Version of Sewing Sequence here. 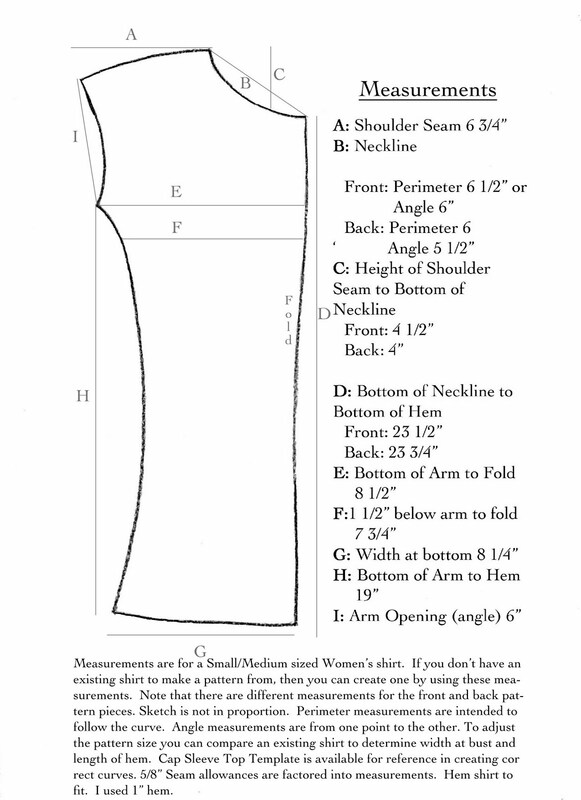 If you don't have an existing shirt then you can build your own pattern using the basic measurements found below. I only had access to a size Small shirt, but you can add or eliminate width to the side seams and length to the shoulder seams if you need to make adjustments. Find a long pieces of paper, a ruler, and pencil and go to town. You can print a this diagram off for reference, but there are 9 basic measurements that I used to recreate the pattern. Some of the measurements are straight across, some are on an angle, and some follow the curve (neckline). I tried to specify if they were on an angle or along a curve. For the most part they will be measured along the straight line of the pattern piece. Find the Printable Version here. The most difficult (and essential part) of the pattern is the armhole and neckline portion. 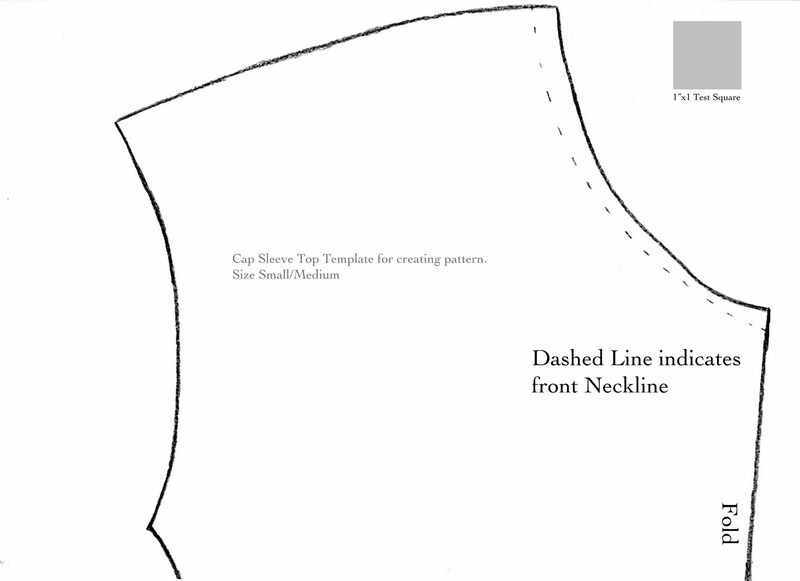 I have provided a printable template that you can use to create the proper shapes for the neckline and armholes. The template is intended to be printed off without margins so select "no margins" on your printer settings. The template only includes the top of the pattern piece. You will want to trace it, make adjustments where needed, and then add the length of the shirt according to the measurements. 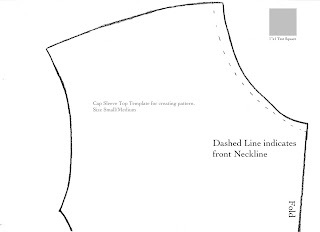 The template has a dashed line to indicate where the front neckline should be. You can trace the template for the back pattern piece, and then cut it to the dashed line and mark your back pattern piece. Note: The measurements that I have included for the length of the shirt are rather long. I'm kind of a long girl and like my shirts to be the same way. It should be plenty long for most people, but if you are on the petite side you will probably want to reduce the length by an inch or so. There is a test square on the template so that you can determine whether or not the template has printed the accurate size. Make adjustments where necessary. Find the Printable Template Here. This really is a simple top to sew. There are a few basic seams, but you can dress this shirt up in so many ways. If you want to make a top like the Sunburst Pintuck Top, or the Ruffled Petal shirt, then you will want to make your embellishments or add your fabric details before sewing together the side seams. 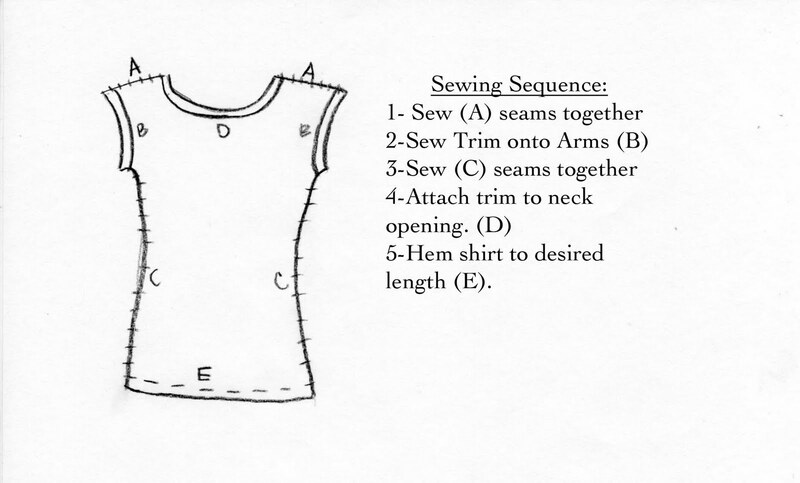 This is the basic sewing sequence that we will follow. We will start with seams "A", or the shoulder seams. To make the sewing seams you will want to put right sides of the fabric together and pin in place (upper left). Pin not only along the seam to be sewn, but also along the length of the shirt. This will prevent the fabric from pulling and shifting. Stitch along seam "A" using a triple stretch stitch. This stitch included a back and forth motion in each stitch. It is great when working with stretch fabrics that put extra stress on seams as they stretch. Use a 5/8" seam allowance when sewing. Backstitch to begin and end each seam. When the two shoulder seams are stitched we will trim our seams to about 3/8" and press. (Lower left and right). When your two seams are sewn your neckline should be connected like this (lower right). 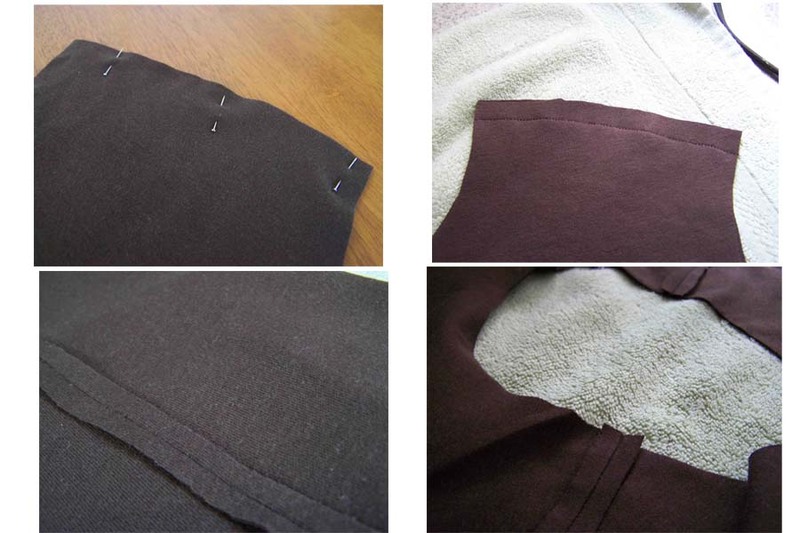 *If you own a serger you will probably want to serge these seams to create a polished look. 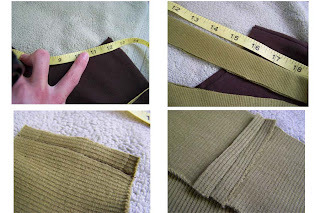 If you don't have a serger, but want to finish the edges you can use an overlock stitch (like the zigzag) for the seams. For more information on stretch stitches look here. It is now time to apply ribbing to your arm openings. Prepare your ribbing by cutting it down to 1 1/2" wide. You will want a long strip (long enough for the length of the two arm openings). You will then fold the ribbing in half and press. This will leave your ribbing about 3/4" wide. There are several ways to apply ribbing, but this is the technique that I used. I cut my pieces to be 1 1/2" shorter than the length of the armhole. I then folded the ribbing in half width wise to mark the center. 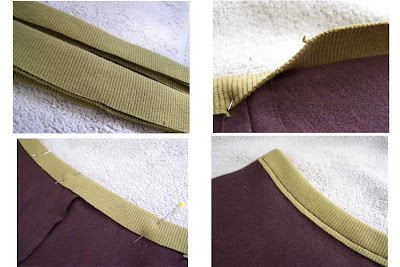 Pin the center of your ribbing at the shoulder seam mark and adjust the ribbing to fit the length of your fabric. Sandwich the shirt material into the fold of the ribbing. Make sure that the material goes right up to the inside crease of the ribbing. Pin ribbing in place (see lower left). The ribbing is cut smaller than the length of your fabric so that it will pull in slightly when sewn together. This will prevent gaping sleeves. If you don't want your sleeves to fit closely to your body then you can cut the ribbing the same length of the arm holes and pin and stitch in place. 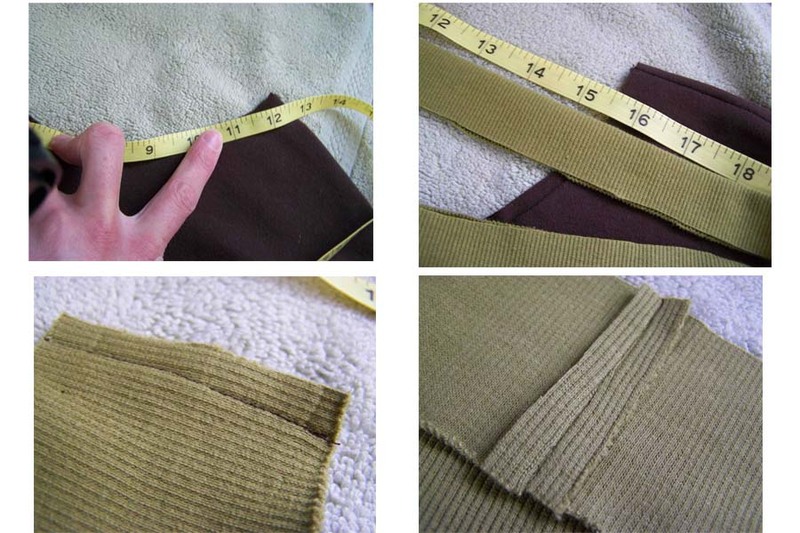 Once your ribbing is pinned in place stitch 1/8"-1/4" from the edge of the ribbing, along the length of the trim. I stitch with the right side of my fabric up, that way I know exactly what my stitching will look like when worn. *I know that there are several ways for applying ribbing, this is the method I used, feel free to use your own. If you are looking for other variations that don't include an exposed raw edge, look here. We are now going to sew the side seams of the shirt. You will want to turn shirt so that right sides are once again together. Pin shirt in place taking special care to align the trim so that the ends are lined up. Stitch along the length of "C" seam. You can use whatever stitching method you prefer for this seam. You can use a narrow zig zag, a triple stretch stitch, or a basic stitch. I recommend using a standard stitch before using a triple stretch stitch or narrow zig zag. Once a proper fit is achieved feel free to use a stretch stitch. I've found that stretch stitches are more difficult to unpick, so achieve the fit first. Backstitch to begin and end your seams. Trim seam to 3/8" and press open, or serge. Applying ribbing to the neckline can be a bit daunting, but it isn't that bad. 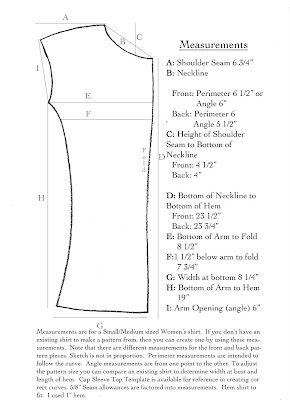 The first thing that you will want to do is measure the length of the neckline. My shirt was 24" around. You will then want to cut a piece of ribbing that is 2/3 the length of your neckline, plus 1/2". I ended up cutting my piece to be 16 1/2" long and 2" wide. You will then create a loop with your ribbing. Stitch the two ends together and press open. Press the ribbing so that it is half of it's original width, 1 " wide. It is time to fit the ribbing to the neckline. You will want to find quarter marks on both your shirt and your ribbing. Find the center of the back of your neckline, and the center of the front of your neckline. You will then want to fold your ribbing into quarters and mark where they are located. This will help as you are trying to fit the neckline to the ribbing. When you have your quarters marked on both the shirt and the ribbing we will begin fitting. One quarter on your ribbing should be the seam that connects the loop. I generally connect this seam in the center back of the shirt. Pin the two adjacent quarter marks of your ribbing to the shoulder seams on your shirt. 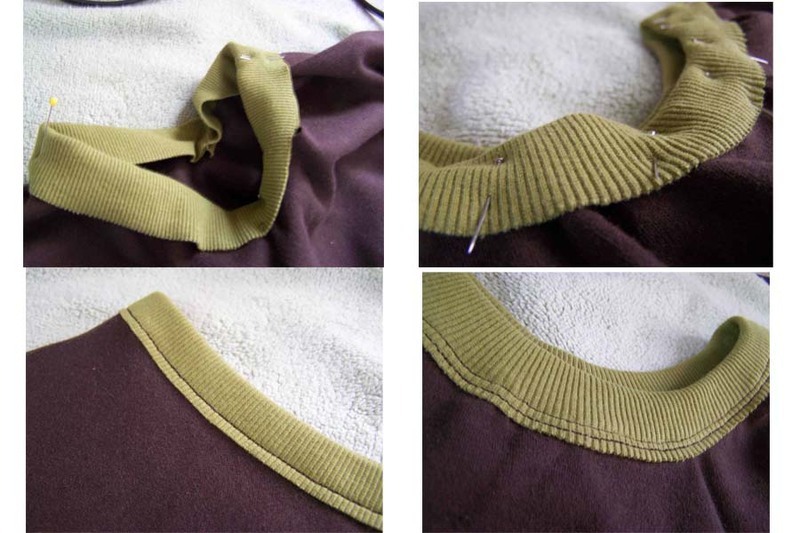 Pin the remaining quarter mark of your ribbing to the center of the front neckline (see top left). You will now want to pin the rest of the collar in place. To do so stretch the ribbing so that it stretches to the same length of each quarter of your shirt. Pin the shirt in place when the material is evenly distributed (upper right). When your shirt is pinned together it is time to sew. 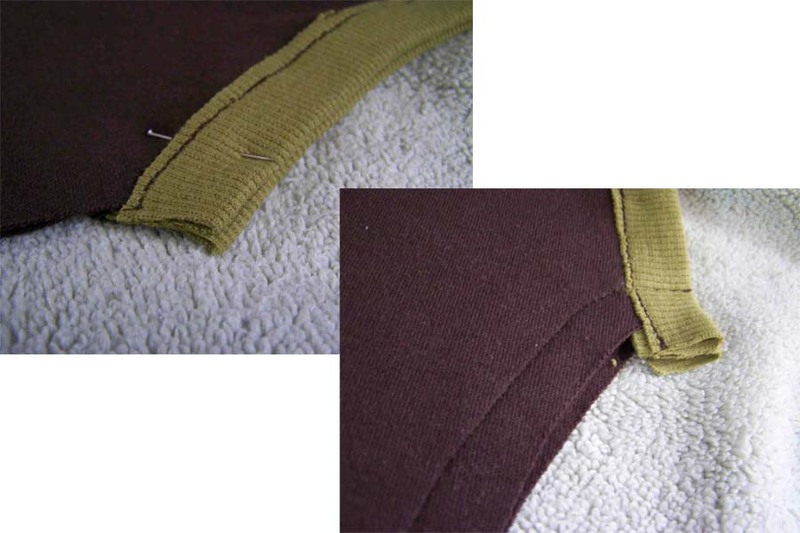 Begin at the center back of your shirt and stitch 1/8"from the edge of the ribbing. 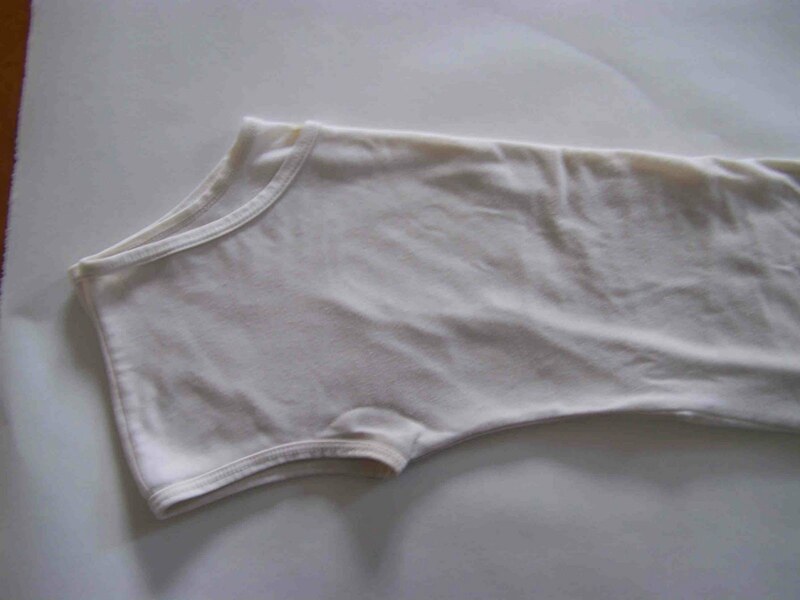 It may help to stitch the ribbing slightly as you stitch the ribbing and shirt in place. Once you have made an initial row of stitching make a second stitched row 1/4" in from the edge of the stitching. I like to use the triple stretch stitch on this step. This is the most difficult part of the process, but now we are through it, and it wasn't so bad. Hem the shirt. You will want to try on your nearly finished shirt and determine how long you want your shirt to be. Fold the shirt up to the desired length and measure how much you need to take it in. Take off the shirt and fold up the hem the same amount all of the way around the shirt. Fold the hem to the inside of the shirt. Pin in place and press (Upper Left). You can use several different methods to hem the shirt. One option is to use a narrow zig zag stitch. You can also use a triple stretch stitch, or a double row of standard stitching. I chose to use a twin needle and stitch the hem. If you have a twin needle, and your machine can accommodate one, then I would suggest using it. To do so you will need a twin needle, two spools of thread, and a bobbin full of thread (I used a bobbin for my additional top spool)(upper right). Here is a great tutorial on twin needle stitching from Burda. Stitch on the right side of the shirt (bottom left), 1/8-1/4" away from the edge of the hem. It should look like this when finished (bottom right). When your hem is finished it is time to press the seams and wear it out on the town. Let me know if you have any questions, I will do my best to answer them. Check out these great link parties that I'm participating in. Also... I have a blog award for you, the Desert Island Blog Award. Because I am so in love with everything that you do! :) Come check it out here. Happy Thursday! Thank you for this fabulous tutorial! I was just looking at one of my cap sleeve shirts last night, wondering if I could recreate it. Yesterday when I read you had an upcoming tutorial I thought it was just for the embellishments but was secretly hoping it was for the shirt itself. Thank you and keep up the great work! this is such a well-written tutorial! 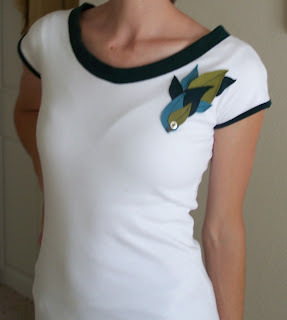 thanks for sharing :) i've never made a cap sleeve shirt, so i'm glad you wrote this tutorial! i have bookmarked it and am going to give it a try. Great tutorial! And I like that the shirt doesn't require setting in any sleeves. This is a REALLY great tutorial! I can't wait to try it. We are similar sizes too, so even better that I can use your measurements. Woot! I just finished writing my own very first tutorial on an easy knit shirt (very different from yours though...) Come check it out! What a great tutorial! Fabulous!! Thanks you so much for posting this tutorial! Can't wait to try my own! You're amazing!! I'm featuring this tomorrow!